Buying a new car? Want a peach instead of a lemon? You need the latest issue of Australian New Car Buyer, out now. It’s the encyclopaedia of new cars, with detailed, informative road tests, written by experts, plus trade in values, fuel consumption numbers, environment and safety ratings on more than 270 new cars and SUVs on sale in Australia. 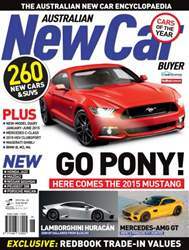 The latest issue features the best of the best, our Car of the Year for 2014, including Mercedes brilliant new C Class, the VW Golf and Mazda2. Australian New Car Buyer is an essential research tool if you want to get the best car at the best price.